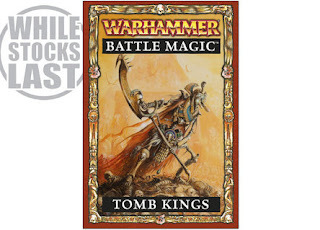 Fields of Blood: The Tomb King Book - Are GW for Real? The two outstanding issues for me with the upcoming Tomb King book concerns direction on where Games Workshop are taking the game. The first of these relates to Magic Items and the second on their Magic system. As I have said previously on this blog most of the problems with “power creep” are in relation to army specific magic items or powers (Daemonic Gifts, Vampiric Powers etc). With the new rulebook GW greatly increased the Common Magic items levelling the playing field to a certain extent. They, then, greatly reduced the book-specific items with the release of the Orc & Goblin book where only eight were included. I am really hoping GW continues this with Tomb Kings, as I do think it is the right direction. The book specific items can be tested far more rigorously in the limited in-house playtesting GW does (they’ll say it is exhaustive but I don’t call what I’m guessing is not much more than 100 games, exhaustive). It will be the first thing I check when I get the book as I think limited race-specific items is incredibly important for long term game balance. If they have reversed this move then people are right – “It’s no fun being green”. One thing that always appealed to me about the Tomb Kings was their unique magic system. The use of the relentless magic of incantations gave the army a flavour of its own – and helped make it one of the most reliable armies under 7th Edition. However, as written, the system didn’t really transfer to 8th Edition. 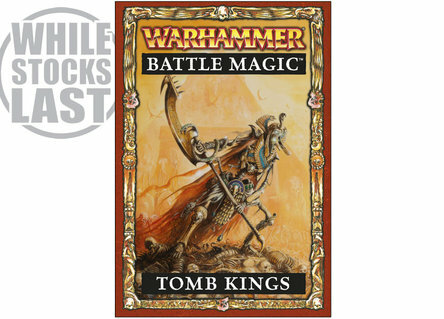 My understanding is that GW have brought Tomb King magic in line with the other races but with their own spell deck. I hope this isn’t the case as it removes a real point of interest. If it is the case, I hope that there is some overlying mechanism that makes them more than “sandy” vampires. That will be the second thing I check when I get my talons on the book. Well, the new GW article about the Tomb Kings says the Liche Priests have access to the Lores of Light, Death and Nehekhara, so I wouldn't be holding your breath about the magic system being different to any other army. I think bringing them in line, whilst boring, was the right decision. Since you can't really build reliable magic phases anymore (well.. not with comp) having an army that could rely on pumping out lots of little spells with little resistance would be a bit much. It's just easier to balance them this way. They can have powerful spells like everyone else AND keep some of the old mechanics (extra movement, more attacks, more shooting, resurrection), but have the same limitations everyone else does. I think it also reigns in the character spamming. If every priest/prince could auto-cast a spell every turn you'd have to make them fairly pricey or else people would be maxing out their characters to take advantage. Looking at the bigger picture GW is moving in the direction of character, but with limitations. This is done so they can control things a bit better. You can see it with the magic items in the new books. Making armies standardized in some ways but adding in character like specific lores and more unit variety seems a better way of balancing the game, if making it seem slightly more dull. But really, just look at they way they've moved with 40k.. things are pretty standard there right now, but the flavour each army gets is what separates them.